With the publication of this fifth volume in the New Poets / Short Books series, I am stepping down from the editorship. Perhaps it is time for me to clarify what I have been doing.
. . . 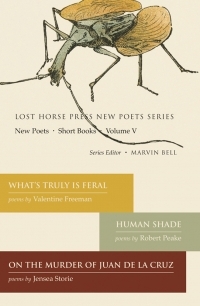 The poets in this volume–Valentine Freeman, Robert Peake and Jensea Storie—like those in the first four volumes, deserve to be better known, but public promotion of the poets was never my primary aim. That would be a bonus, but only a bonus. Rather, I hoped the chance to put together a short book for print would reconfirm for each poet the personal, even intimate, value of the imagination in general and of poetry in particular. Their own imaginations, and their own poetry. I invited poets whose inner lives, I felt, would be rewarded by a lifetime that includes poetry or another art. I do not know if they learned the lesson or not. Check back in ten years. Poetry at its best, like philosophy, is a survival skill. On the way out as editor, allow me to remind readers of the talented poets who have appeared in this series to date, listed alphabetically by volume: Boyd Benson of Clarkston, WA; Gwendolyn Cash of Kennewick, WA; Lisa Galloway of Portland, OR; Victor Camillo of Iowa City, IA; Tim Krcmarik of Austin, TX; Patricia Staton of Astoria, OR; Emily Bobo of Bloomington, IN; Joel Craig of Chicago, IL; Amy Lingafelter of Joliet, IL; Jesse Fourmy of Hilo, HI; Karen Holman of Ypsilanti, MI; Abby Murray an Army spouse, currently of Colorado Springs, CO; Valentine Freeman of Portland, OR; Robert Peake of Ojai, CA; and Jensea Storie of Oceanside, CA. Their work-for-pay ranges widely. Three are teachers, one of them a mathematics professor. One is a librarian, two are art directors, one is a firefighter, one a social worker, one a technical writer, one a builder of miniature houses, one a vet’s assistant, one a waitress, one a computer techie, one a special agent with the Drug Enforcement Administration. Readers may have noticed that I replaced the turgid cover blurbs we have come to expect on books of poetry with excerpts from the poems, and replaced the usual meaningless listing of colleges, publications and awards with personal statements. It was also my intention that each poet should commit to a manuscript that embodied his or her individuality, by following his or her instincts, sans editorial meddling or “house style.” Hence, I dodged their requests for detailed input and kept my suggestions to a minimum. I selected poets who, I felt, were writing from within their language and experience rather than simply applying skills learned in the classroom. Our country is being attacked from without and within. Idealogues have taken the place of thinkers and judges, democracy has been distorted by TV politics, and the so-called American Dream is fast disappearing as health, safety and privacy become increasingly the luxuries of the wealthy. As always, the soul of a nation survives in the interstices of political and economic events. It survives, preeminently, in the arts. Art makes life better, even in the harshest of circumstances. In the glut of poetic gymnastics, amusements, hip talk, glittering confessions and conventional commentary, there will yet and always be, I believe, poets who write from inside, for whom poetry is a way of thinking from within emotion, and for whom a poem is about what happens as you write, read or hear it. No village explainer can tell you why this matters or persuade you to love it. I have cared for my students, and for these “New Poets,” more than they know. But they had to do the work themselves for it to matter. As I said, check back in ten years. Maybe twenty. Bring death closer to my heart, I said. Inside me, me, me, me.